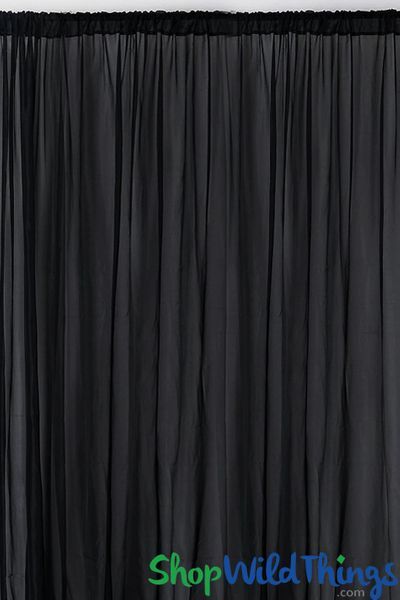 Finding the perfect wedding and event backdrop that�s soft, romantic, compact and easy to work with is now a reality with our 10� Tall by 10� Wide Sheer Black Curtain Panel that also has the all-important feature of being flame resistant! 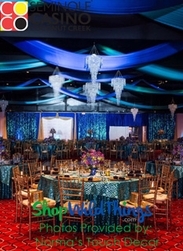 Elegantly trim windows, drape from the ceiling or create that dreamy backdrop you�ve always envisioned with our luxurious, flowy fabric panels that are so easy to use and are ready to hang or swag for any application you desire. Each panel has a 3 1/2" rod pocket on each end! 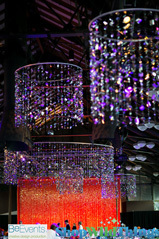 Large and roomy for pipe and drape kits, rods, bars, poles and wooden structures or branches. Drape across the ceiling or swag from the ceiling to the wall. All of the edges on this event curtain are beautifully finished and the high quality of this fabric is apparent up close or from afar. 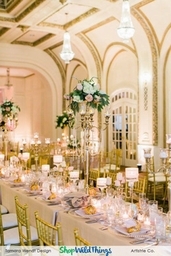 These panels are silky smooth so you can effortlessly create ethereal backdrop focal points for wedding ceremonies, head table backdrops or photo shoots. 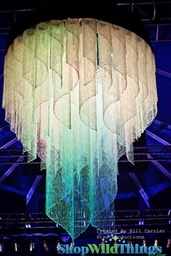 To highlight a large event venue, use 2-Tiered Hanging Frames to highlight large event venues. 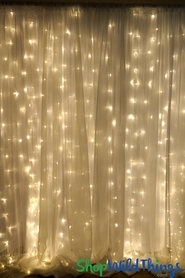 To hide or conceal walls and less than desirable backgrounds, hang these sheers in front of LED Light Strands for a look that's upscale, impressive and serves as a posh backdrop. 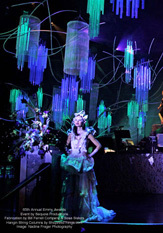 Hang sparkling crystal strands or flower garlands in front of the sheers to add depth, interest and texture. 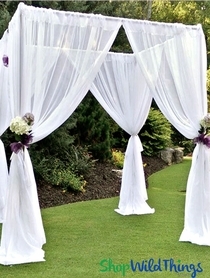 You can also tie back the sheers using an elegant Silk Flower Garland or a decorative curtain tie back. 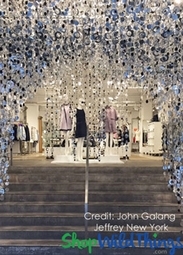 Our Sheer Polyester Panels are 10 Feet High x 10 Feet Wide per panel. They are inherently Flame Resistant (I.F.R. ), Pass NFPA 701, CA Title 19 Small Scale. 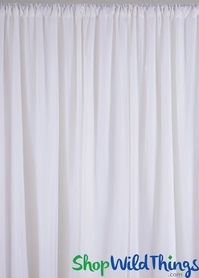 100% Polyester Sheer Fabric - super soft and flowy.